Do you want customizable options to protect your forms against spam submissions? WPForms Custom Captcha addon makes it easy to create a custom question and answer or Math Captcha field for spam prevention. 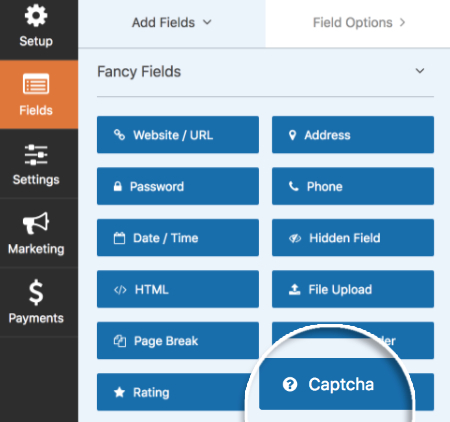 In this article, we will show you how to install and use the Custom Captcha addon for WPForms. Note: Are you looking for details on Google’s reCAPTCHA? Our tutorial on spam free contact form covers all available anti-spam methods for WPForms. Before we get started, be sure to install and activate WPForms on your WordPress site. Also, you’ll need to install and activate the Custom Captcha addon. When the Custom Captcha addon is activated, you’ll be able to go in the form builder and see the option to add a Captcha field. To create this field in your form, simply drag and drop it into the form preview panel in your form builder. The Captcha field will always be required so users have to answer the questions before submitting the form. If you’d like to edit the field, you can click on the field in the form preview panel to open up its Field Options. Here you can make changes to the Custom Captcha field, such as Label, Type and Description. The Math Captcha will randomly generate addition, subtraction, and multiplication questions in the form. When the form is published on a page, the field will display a new random Math question each time the page is loaded or refreshed. If you’d like to customize the Math Captcha, you can do so using some custom code. Please see our tutorial on how to change the Math Captcha for more details. If you’d prefer, you can use a custom question and answer instead of the Math Captcha. To do this, in Field Options panel, go the Type field to select the Question and Answer option. Next, add a question on the first field, and its answer in the second field. If you’d like, you can add additional question and answer pairs. The Custom Captcha field will display a random question from the sets of question and answer pairs when the page is loaded or refreshed. To add or remove sets of questions and answers, click on the plus (+) or minus (-) buttons respectively. With multiple sets of questions and answers, the form will display one question randomly each time it is loaded in the browser. Once you’re done configuring the Captcha field, be sure to save your form. That’s it! 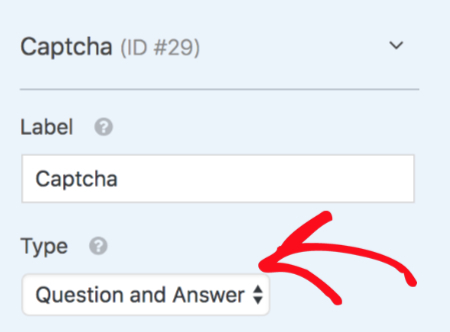 You can now add a Custom Captcha field in your forms to customize your spam prevention method. Next, do you want to show users a confirmation message or a specific page after their form submissions? Then check out our guide on how to set up form confirmation. 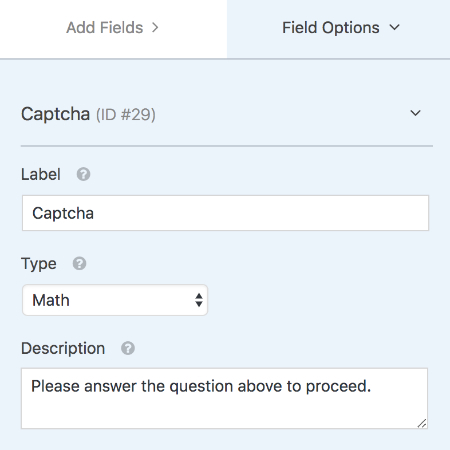 Changed: Captcha field display priority in the form builder. Fixed: JS file not loading on frontend, causing error. Fixed: Zero (0) math equation answers not being allowed.